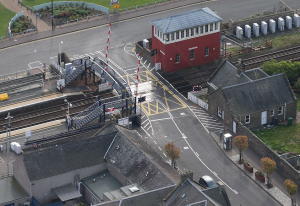 Residents of Carnoustie are being reminded that the first of two road closures to enable work to upgrade the level crossing on the town’s Station Road will begin on Saturday night (Feb 9). During the eight-day road closure, Network Rail engineers will begin work to renew the signalling system and infrastructure at the crossing adjacent to the town’s station in a £5.5m investment. Work will include replacing the existing two long level crossing barriers with four barriers, enhancement of signalling equipment and complete renewal of the level crossing surface. Due to the nature of the work, this upgrade can only be delivered by closing the crossing for two extended periods and putting road diversions in place. The level crossing will be closed to road traffic from the evening of Saturday, February 9, until the morning of Monday, February 18, and again from the evening of Saturday, March 9, until the morning of Monday, March 18. The railway through Carnoustie will be closed each Sunday between February 10 and March 17. Euan Falconer, Network Rail’s project manager for the upgrade, said: We appreciate there will be disruption as a result of this work – particularly as there is a prolonged period where the road will be closed. However, this is the only way in which we can deliver the work required safely and efficiently. “This work will further improve the safety of both road and rail safety and also enhance the reliability of the railway on the busy east coast main line. We are grateful for the patience of the local community while we carry out this important work. Work at Carnoustie is part of a £9m package of enhancements that Network Rail engineers will deliver between Aberdeen and Dundee over six weekends in February and March – which also include track renewal and upgrades to the signalling system.